Improved product quality by meeting close thickness and profile tolerances as needed by the modern day customers, through powerful controls and adjustments. These tolerances may be much closer than specified in various international standards. More flexible rolling schedules to ensure short delivery times and economical rolling of smaller lot sizes. For achieving these demanding requirements, many important features are incorporated in the modern conventional hot strip mills. Some of these are described below. Reheating furnace – Modern hot strip mills are equipped with energy efficient walking beam furnaces which are normally computerized controlled. These reheating furnaces uniformly heat the slabs to the target temperatures at the required production rates and without skid marks and without cold spots. These furnaces are capable of receiving cold or hot slabs as the charge material in the furnace. Descalers – Descalers are a must in hot strip mills for attaining good surface quality. Present day descalers employ state of the art nozzle technology with highly effective application of high pressure water (upto 400 bars). Descalers are usually of closed design to prevent water from escaping. Slab sizing press – A slab sizing press in the roughing mill area has the technological advantage over a conventional edger. Besides large width reductions (up to 350 mm), it results into a distinctly better through forming of the slab right to its centre. Slab sizing press produces flatter dog bones leading to reduced respreading and greater sizing efficiency. A special short stroke operating mode at the slab head and tail results in less cropping losses and higher yields. Slab sizing press enables the number of different casting sizes in continuous casting machines to be reduced to just a few standard widths and thus offers more flexibility in production. Slab sizing press improves width tolerance along the entire strip. Hydraulic edger adjusting system – The width of the strip from its head to its tail is controlled by this system. The quick dynamic response of this system enables the fast corrective movements at the material head and tail for reducing cropping losses and in controlling the width over the length of the strip. Latest generation edgers are fully hydraulic facilities without any additional electro mechanical adjusting systems. Coil box – It is installed between the roughing mill and the finishing mill to form coils of transfer bars, thus serving as both material and heat accumulator. During uncoiling, tail end of the transfer bar becomes head end of the transfer bar as it enters the finishing mill. Coil box enables a shorter distance between the roughing mill and finishing mill. It also minimizes the temperature drop of the transfer bar entering the finishing mill. Coil box can be with mandrel or it can be mandrel less. The mandrel less coil box contributes further to reducing the temperature drop at the coil inner wraps in comparison to mandrel type coil box. Mandrel less coil box also makes space to install the side heat shields which contribute to reducing the temperature drop at the strip edge. Coil box is shown in Fig. 1. Automatic gauge control (AGC) and hydraulic gap control (HGC) – The control of the gap between the work rolls, and in other words the strip thickness, is made in two steps with two control modules (Fig 1). The first module is called AGC while the second module is known as HGC. AGC receives thickness set points from a higher level system. It calculates and compensates for such things as roll wear, heat expansion in the rolls, stretch of the strand and other immeasurable quantities which affects the gap. A thickness measurement is made during the passes, which is used by AGC. The thickness feedback is passed through a PI controller and added to the total gap deviation. It can be seen as model error compensation. This compensation changes the cylinder position reference in the HGC. There is no thickness feedback control in the HGC. HGC controls the gap between the two work rolls. HGC uses the higher level set points as roll gap reference values. Measurements from position transducers on the cylinders and the current compensation are used to calculate the roll gap. The HGC is position controlled and uses the reference and the true gap to control the strip thickness. Automatic width control (AWC) – Excellent width accuracy an be achieved by providing the hydraulic AWC system on the vertical edger from head end to the tail end of the strip. Hydraulic cylinder operated width control system is used. This system work as the short stroke control for the head end and tail end of the strip and as a AWC system for rest odf the strip. Electro mechanical servo valves precisely control the hydraulic ceylinder position. Work roll bending – In a hot strip mill, the backup rolls have a large diameter for supporting the work roll and prevent it from bending. But in practice even backup rolls get bent when the force on the bearing housing becomes larger. This makes the force applied on the work roll higher closer to the bearing housing and smaller at the middle of the roll. The strip on the other hand operates with a reactive force. This acts onto the middle of the roll. This in turn bends the work roll and affects the strip profile (Fig 2). Work roll bending system enables profile shaping of the strip by applying a counteracting force on the work roll bearing housing. Application of a large bending force makes the strip more flat. The bending force is constantly changing and the reference force is calculated as a function of the rolling force. Four hydraulic cylinders on each side generate the force. Continuous varying crown (CVC) – Another way to change the strip profile is to use roll with a profile. The gap between the rolls can be changed by axial shifting of the rolls (Fig 2). The CVC technique is also known as roll shifting technique. CVC technique has slower dynamics but a wider range than work roll bending. 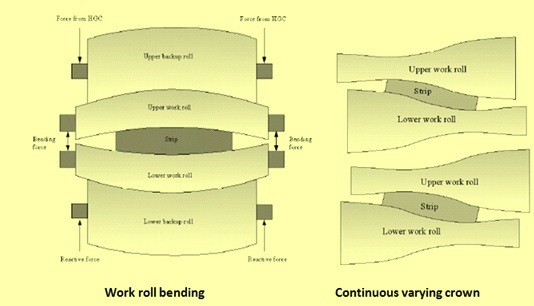 Since CVC and work roll bending complement each other, both the techniques are normally used in the modern hot strip mills. Roll eccentricity compensation – Roll eccentricity is a periodic disturbance caused by a structure of back up rolls in rolling mills, and it affects product thickness accuracy. It cannot be measured directly by sensors, so it should be identified by measured thickness or measured roll force. When there is a large difference of diameters between top and bottom back up roll, the performance of roll eccentricity control using feedback signals of roll force or thickness has not been so good. Also it has been difficult for the control to be applied from the most head end because it is necessary to identify the roll eccentricity during rolling. Roll eccentricity compensation control identifies top and bottom roll eccentricity respectively from one signal of roll force and it starts the control from head end. Work roll lubrication – By lubricating the barrel of the work rolls, the surface defects are avoided and roll wear is reduced. The advantages of applying lubrication media onto the work rolls include avoiding scale build up and peeling of the work roll surface with a minimum of rolling oil, improved strip quality, reduced operation costs, extended mill utilization times, extended mill limits and reduced energy consumption. Intensive cooling system and Edge masking – The strip cooling system cools the strip rolled by the finishing mill and it is located on the run out table between the finishing mill and the down coiler. The cooling system is designed as a laminar flow system on both top and bottom, incorporating a line side head tank system. The cooling zone is divided into the required cooling banks which will consists of intensive cooling banks for faster cooling, normal cooling banks for regular cooling, and the cooling banks for fine temperature control in order to achieve the desired cooling patterns and coiling temperatures for dual phase and trip steels. The combination of laminar cooling and edge masking system prevents excessive cooling of the strip edges, thereby minimizing stress differences across the strip width. Advanced down coilers – A hydraulically adjustable entry guide is provided at the terminakl end of the run outroler table serves to centre the strio before it enters the downcoiler. The strip, running in at the finish rolling speed, is reliably siezed by the pinch roll unit and directed onto the coil mandrel. The features of the down coiler include hydraulically operated wrapper rolls, controlled hydraulic spreading of the mandrel, automatic calibration and exact hydraulic adjustment of the gap and the mandrel rolls, controlled limitation of the wrapper roll forces as a function of strip dimensions and material and strip tension at the strip head built up after two to three windings.